We understand that a title transfer can be stressful and that the paperwork and information requests may seem overwhelming at times. We designed our residential title services and real estate closing around your peace of mind. We are here to help! 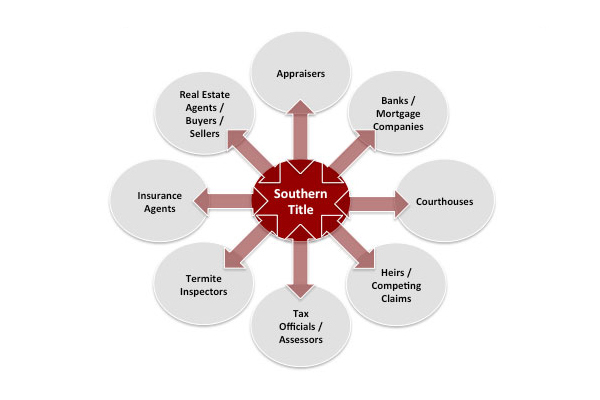 Southern Title is the facilitator of the entire real estate closing. What appears from the outside to be simply a group of people sitting around a table signing a very large stack of papers in an office is, in fact, a very complex process that requires a large number of interactions with many different groups, from bankers to termite inspectors, researchers in area courthouses to local real estate agents, to make the stack of papers ready for signing. This process can vary between one day and many weeks, depending on how many issues require resolution and the speed of the resolution in each case. Learn all about house closing process in our ultimate guide to the real estate closing process. Buyer wants to make an offer on a property. Buyer completes a purchase agreement / sales contract. Buyer / Buyer's Agent or Seller contact Southern Title to schedule a closing. Southern Title contacts the relevant people to make the transaction work. 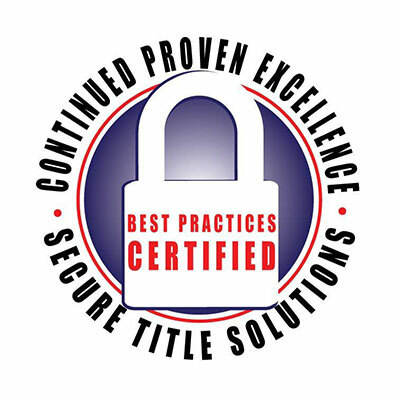 Buyers, Sellers & Agents come to Southern Title and transfer the property title. An escrow or sales contract (agreement to close) starts the process by opening a title order that is then processed. Relevant tax information, loan payoffs, surveys, homeowner/maintenance fees, inspections/reports, and hazard and other insurances as well as legal papers are ordered and title commitments/preliminary reports are reviewed and sent out. Review lender instructions/requirements, review instructions from other parties to transaction, review legal and loan documents, assemble charges and prepare closing statements and set closing. Escrow/settlement officer oversees closing of transaction. Seller signs deed then buyer signs new mortgage. Old loan is paid off and new mortgage is signed. Seller, real estate professionals, attorneys and other parties to the transaction are paid. Documents are recorded in the county in which the property is located. After the signing has been completed, the title agent will forward payment to any prior lender, pay all parties who performed services in connection with you closing, and pay out any net funds to the seller before recording the documents with the county. This all happens without any needed involvement from the buyer or the seller. Remember that when you are buying or selling a property, you are changing the legal owner of the property (that’s the essence of a title transfer). During the process, any error will cost you time, money and stress if it is not handled correctly. Trust us to make your closing hassle-free. Verifying that all of the legal, tax, mortgage and insurance issues are cleared for your real estate title transfer is our business – and we excel at it.